Hello Professionally Integrated. 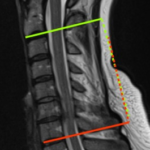 Here is a great study where the authors suggest that MRIs are not the best at determining the sagittal alignment, but up right Xrays are a very good choice. At Professionally Integrated we want to help you build your practice based on your knowledge, not your sales tactics. Take this article to your surgeons in your area and work together. Look what the authors say and how it only strengthens our care: "Proper evaluation of sagittal balance is of paramount importance during the management of cervical . . .